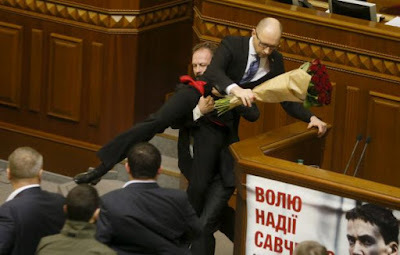 KIEV, Ukraine -- A fist fight broke out in the Verkhovna Rada (Ukrainian parliament) on Friday, after one lawmaker tried to lift and hurl Prime Minister Arseniy Yatsenyuk while he was delivering his annual report. Rada deputy Oleg Barna removes Prime Minister Arseny Yatseniuk from the podium, sparking a brawl, during the parliament session in Kiev, Ukraine, December 11. The fight appeared to begin as member of parliament Oleg Barna from President Poroshenko’s BPP party tried to forcibly remove Yatsenyuk from behind the podium, news channel RBC Ukraine reports. Barna walked up to the podium with a bouquet of flowers, set them in front of the Prime Minister and grabbed him. Live footage from the Rada then shows other parliamentarians going after Barna, pulling the MP away from the Prime Minister as a fight ensues. Among those throwing punches was the Minister of Energy, Vladimir Demchishin. Shortly after, Vladimir Groysman, speaker of the Rada, can be seen urging lawmakers to return to their seats. Head of the BPP, Yuriy Lutsenko, later issued an apology for Barna’s behavior and said the party will reprimand him. Barna told Ukrainian news site Ukrainskaya Pravda that he manhandled the prime minister because he thinks Yatsenyuk should resign. “If he doesn’t resign, I’m afraid, people will have to carry him out,” Barna said. BPP and Yatsenyuk’s People’s Front are in a coalition government with several other parties, the group’s cohesion has often been tested. Recently, Oleh Lyashko’s Radical Party pulled out of the coalition amidst violent protests outside the Rada against a draft to increase regional powers. Yatsenyuk, who was appointed Prime Minister in 2014 and whose speech today signified the end of the government’s grace period—meaning parliament can officially call for a vote of no confidence now—has taken some more metaphorical hits recently. David Sakvarelidze, Ukraine’s deputy prosecutor general, told the London Times earlier this month that Yatsenyuk is being investigated over his involvement in a $90 million-a-year corruption case. Yatsenyuk denies the claims, saying they are part of a political smear campaign. Meanwhile, the prime minister’s approval rating has fallen to just over 2 percent as the government continues to struggle in its fight against corruption. A strong ally of his, Mykola Martynenko, resigned as a member of the Rada in November, further intensifying the pressure oligarchs are putting on Yatsenyuk to do the same. Russian media is particularly interested in the calls for Yatsenyuk to resign, running false reports that as early as August he had already decided he was going to resign. On Friday, he said that he would resign only if the Rada declares a vote of no confidence against him — a process that can only begin starting today. Tempers have run high in Ukraine’s parliament on numerous occasions. In 2013, MPs on opposing sides brawled while then-President Viktor Yanukovych addressed the parliament and in February this year, members of the Self-Reliance party and the Fatherland party scrapped over an anti-corruption bill.